Inspiring women to vibrantly excel in all dimensions of life. Some of you have probably read or heard about self care. The idea is that we need to be the best version of ourselves to do well at work, to take care of our families, to think clearly, etc. I am a firm believer in taking time for yourself, but it's not always been easy for me. I recently found an unconventional way of taking care of myself that I wanted to share with you--taking public transportation to work. Yup, I am in love with metrotransit! Some of you know I'm in a Master's of Public Health program through George Washington University. I recently took an Environmental Health Class, and the topic of public transportation came up. We were required to calculate our ecological foot print--includes our carbon footprint and more. The Global Footprint Network describes the ecological footprint this way, "It shows how carbon emissions compare and interact with other human demands on our planet, such as food, fibers, timber, and land for dwellings and roads." 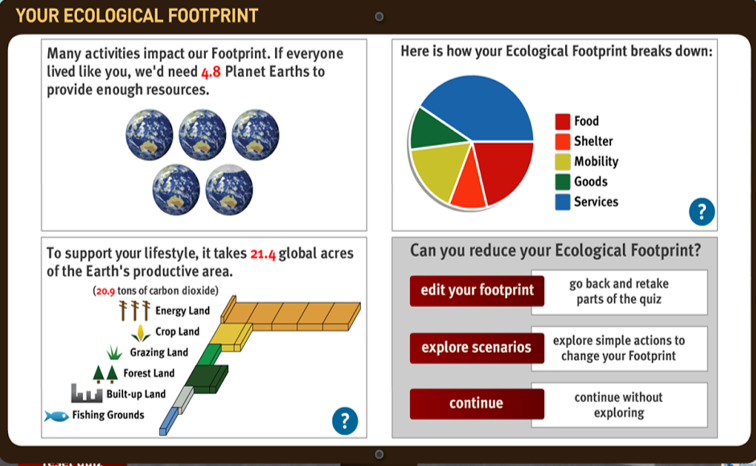 I highly recommend taking the ecological footprint calculator. It only takes a few minutes. I will say I was SHOCKED at my ecological footprint (check it out below), but then when I started to think about it, I realized my footprint has gotten bigger over the last few years. I used to take the bus to school and work about 3 years ago, and I rented a small apartment in a neighborhood where I could walk to the store and to eat, etc. This year, my husband and I just bought a large home on the outside edge of the greater Minneapolis metro. Transportation really affects my footprint. My commute is only 18 miles, but I’m driving my car at least a half hour on the way to work and sometimes up to an hour on the way home from work each day. I really need to think about taking the commuter bus! I realized that not only was my drive contributing to my ecological footprint, but it really is a part of my day I dread. I usually listen to MPR, which I love, but I also can't stand the stress of trying to get somewhere quickly or having to park or paying for so much gas all the time. The drive simply stresses me out! I had seen transit buses in our town before, so I decided I was going to look up the bus services in my area and see if I could realistically use metro transit to get to work and to work on time! So far I've taken public transit on and off for about a week and a half. Below is a list of all the benefits I've noticed from not driving myself to work. Improved mental health--No more stressing with road rage, the pain of parking, or the anxiety of driving in bad weather (like the icy roads we have today!). Smoother morning--No more last minute gas light issues or warming up the vehicle. Time for reading or listening to podcasts--I am finally reading for pleasure again. Time for writing--Hence ceruleanonline.com; my blogging time has been given back! Time to prep for work, catch up on email or other tasks. Time for mediation--I use the Calm app. It's a good time to unwind. Idea brainstorming--The ride and walk to the metro clears the mind, making space for awesome idea generation. Feelings of being part of something bigger than you! Global, responsible citizen! You're there for your fellow bus mate! Your lives touch other lives every day. Overall, my commute takes about 50 minutes to and from work. It's slightly longer than driving sometimes, but by the time I park or sit in traffic, the time is similar. For me, the benefits are totally worth it! If you're sick of hearing the same self care tricks like get a massage, etc (even though massages are amazing! ), try this trick and take the bus or train instead if there's one near you. You may even think about driving to a Park and Ride and taking the bus or train the rest of the way. What are your "unconventional" self care tips and tricks you use?! I'd love to hear from you! Back to Koffee With KFA Blog and Vlog!